Bird-B-Gone Inc.’s Bird-B-Gone University was recently audited for review and approval by the California Department of Pesticide Regulation (DPR). Bird-B-Gone received excellent remarks from the DPR as a four hour Continuing Education (CE) credit in Bird Control training. Bird-B-Gone University, a bird control training course offered by Bird-B-Gone, was recently audited by the Department of Pesticide Regulation. The course covers many things commercial bird control installers need to know. The course qualifies as a continuing education course through the DPR. Bird-B-Gone provides this free training at their facilities in Santa Ana, CA at least every other month. Bird-B-Gone University is designed to ensure pest control operators are equipped with the necessary knowledge and tools to properly install Bird-B-Gone bird control products. “All questions from the attendees were answered quickly and accurately. In addition, the course materials and comfortable facility, along with the announcement at the beginning of the course to silence cell phones, created an environment conducive to learning. Overall, the course was informative and well received by the attendees,” says Estridge. To learn more about becoming an Authorized Installer of Bird-B-Gone’s bird control products click here. Birds love to sit and nest in high places that protect them from predators and weather. This means that places with open ceilings with beams and rafters, like warehouses or manufacturing facilities, are perfect for birds in search of a nesting area. Birds will sit on beams, pooping and preening, which causes a huge mess but the acidic droppings can erode building materials. Bird droppings also carry up to 60 transmittable diseases and when dried can blow around in dust form and be inhaled by humans. Nesting also creates a mess and a hazard. Workers who have to climb in the rafters, to change lights for example, are at risk of being injured or picking up diseases. Additionally, droppings fall on equipment and product or anything produced in the open area facility, potentially damaging or ruining the expensive equipment and product. 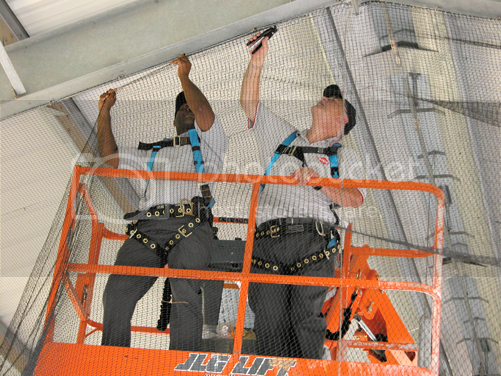 Bird netting requires professional installation and installation hardware. If you do not have an installer, we can connect you with authorized installers in your area to ensure your bird netting is properly installed and your bird problems are solved. Accumulated bird dropping have created quite the stink at La Jolla Cove, giving local San Diego residents something to complain about. Merchants say the smell from the accumulated bird droppings have been driving away business and sickening patrons. Recently, the New York Times reported on the incident, bringing the problem into the national light, generating embarrassing publicity or the scenic spot. Bird Net: A U.V. stabilized polyethylene mesh that keeps birds from entering unwanted areas, especially where people eat. The above bird problem can happen anywhere – the key is to have access to the proper bird control products to rectify the situation and ensure the birds do not return and the patrons remain happy and healthy. Pigeon poo is threatening the Alexandra bridge across the Clutha River, so the birds have to go. New Zealand Transport Agency (NZTA) senior asset manager John Jarvis said the bridge’s structural steel was being corroded and, while it was not an immediate safety risk, action was needed to reduce the 400-strong flock of resident pigeons so damaged areas could be repaired. Recent studies have shown that every year, thousands of protected migratory birds die in tailings or detention ponds used for industrial waste or filtering. Tailing ponds may contain bitumen, polycyclic aromatic hydrocarbons, volatile organic compounds, naphthenic acids, brine, heavy metals, and ammonia—substances that are harmful, even fatal to birds. The problem arises when birds mistake these ponds for fresh water. Without effective bird control measures to keep birds out of these ponds, the birds are doomed to suffer illness or even die. Most government agencies require companies to implement a comprehensive bird deterrent system if they plan to operate these types of ponds. Let’s face it, pest birds can cost you a lot of money. Especially when they gather, nest and poop in airplane hangars, canopies, garages, factories, warehouses, eaves and other covered areas. There are many ways to humanely get rid of pest birds. One of the most effective is bird netting. It makes sense when you have hundreds to thousands of square feet to cover. The netting can stretch over all beams, ledges pipes and other areas birds can roost or nest on. Not to mention, Bird Netting is one of the few products that can successfully solve a bird problem where birds have been nesting. When birds establish a nesting site they can be very territorial about keeping their home. Bird netting acts as a humane barrier that completely blocks birds from reentering the site. Mission Viejo, CA – Bird-B-Gone, Inc. leading manufacturer of effective, humane bird deterrents would like to announce a new addition to their line of professional grade bird control products, Heavy Duty Pond Netting. Recent studies have shown that every year, thousands of protected migratory birds die in tailing or detention ponds used for industrial waste or filtering. Birds mistake these ponds for fresh water and often become poisoned by toxins present in the water. Bird-B-Gone has unveiled its new Bird Control Channel on the Today’s Facility Manager website. Founded in 1992, Bird-B-Gone’s products have helped solve pest bird problems in commercial, industrial and residential settings across the globe. Bird-B-Gone offers effective and humane solutions to prevent birds from landing and roosting in unwanted areas. Products include Bird Netting and Hardware, Bird Spikes, Electric Track Systems, Live Traps and more. Bird-B-Gone has a devoted team of bird control engineers with over 80 years of combined experience to help in all aspects of bird control including design and installation. Visit Bird-B-Gone’s Bird Control Channel to learn more. 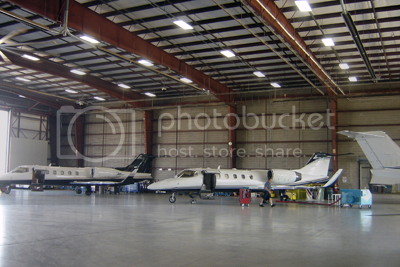 Airplane hangars have often become a natural habitat for birds. They are wide open, offer shelter and ideal nesting areas. Clinton Air Force Base in Oklahoma had six hangars with 200-300 house sparrows in each hangar. Lockbourne Air Base in Ohio had 2,000 to 3,000 house sparrows between three hangars with an additional 2,000-3,000 starlings. Along with these birds come the droppings and debris they leave behind. Bird droppings, accumulating on the aluminum skin of airplanes, can corrode the metal and eventually weaken the structure itself. Another serious concern is that if droppings, feathers, and other matter get into the engines, critically important parts must be cleaned as they could stop an engine during flight. Cleaning an aircraft engine is very expensive and time consuming. Pest bird droppings can also pose significant health risks, carrying and transmitting any of 60 known diseases. Sparrows and Feral Pigeons can carry bacteria causing Salmonellosis. Feral Pigeons carry Ornithosis, which is similar to viral pneumonia. Not only do the droppings and debris left behind by birds damage the airplanes kept in hangars, they are also dangerous to the personal working on the planes. Problem: Pest birds are causing added maintenance to aircraft and endangering airline personal with their droppings and debris. Thousands of dollars spent each year on cleaning aircraft skins, engines and airplane hangar infrastructures. Solution: Install bird netting in the airplane hanger. Bird netting is an exclusionary bird control system. Once installed, pest birds are excluded from the area being protected by the bird net. It is often necessary to install bird netting on the sides of the walls as well as under the roof. The goal is to block off any areas that pest birds will find attractive to land, roost and nest. Once installed, the bird netting is virtually invisible and will need very little maintenance. In fact there are bird net installations inside airplane hangars that have gone untouched for well over 10 years and are still as effective as the day that they where installed. When choosing bird netting to install in an airplane hangar or any area, be sure to get heavy-duty bird netting that has a break strength of at least 45 pounds. This ensures that the netting will be strong enough to keep birds from defeating it. Bird netting comes in various mesh sizes. The ¾ inch mesh bird netting is ideal for all types of birds, the mesh is small enough so that even small birds like sparrows cannot get through. If large birds like pigeons and gulls are the issue, choose a bird netting with a 2-inch mesh size, this can save a lot of money for large bird netting jobs. If the bird netting installation looks to be too complicated, look for a professional bird control installer in your area that can help. Manufacturers of bird control products can usually suggest the right person or company for the job. Bird Net 2000 is a heavy duty polyethylene knotted net used to block birds from entering unwanted areas. Our heavy duty bird netting has the longest guarantee in the industry – 10 years, is U.V. resistant and is available in various sizes and custom cuts. Bird Net 2000 is the #1 bird net specified by architects and government agencies. Bird netting is used to exclude pest birds from areas such as rooftops, warehouses, airline hangars, overhangs, eaves and other areas. Bird Netting will provide 100% exclusion of birds and is a long-term humane bird control solution. This new video will teach you the general applications of Bird Netting including where it can be installed, various types of bird netting and hardware available, and more. If you have questions about bird net installation, or on choosing the right bird net, please call our sales team at 1-800-392-6915. Our bird control engineers can help with everything from helping you quote materials, bid on a job, and provide technical installation advice. Oil refinery ordered to pay $850,000 in penalties after dozens of migratory birds died in an oil retention pond. The deaths occur when birds mistake these toxic ponds as fresh water sources . Fines for killing migratory birds are steep, and many plants are looking at effective solutions for keeping birds safe including sound and visual deterrents set u around the area to try and dissuade birds. One effective bird control solution for retention ponds is installing a heavy duty netting over the pond suspended by perimeter posts. The bird netting would act as a physical barrier, preventing birds from accessing the water altogether. ﻿CASPER, Wyo. — The owner of an oil refinery near Rawlins with a raft of pollution problems in recent years has agreed to a multi-million dollar settlement with state regulators regarding a 2010 incident that killed dozens of birds. Sinclair Wyoming Refinery Co. will pay $850,000 for releasing oil into a wastewater evaporation pond at its refinery, the Wyoming Department of Environmental Quality announced Monday. Sinclair also agreed to spend $4.5 million on equipment upgrades and training. On April 25, 2010, the company notified state environmental regulators that oil had been released into one of the refinery’s wastewater evaporation ponds. After the release, 80 migratory birds were found dead in the polluted pond, a company spokesman said shortly after the incident. The final number of birds affected was far higher, state regulators say. Archie Corpuz of Archie’s Aloha Pest Management stepped forward to solve a persistent problem of cliff swallows nesting in the eaves of the Avila Beach Community Center. On Monday, his business installed nets to discourage the birds from building their mud nests on the center. The Avila Beach Civic Association bought the nets for about $700, and Corpuz installed them for free. The problem began when an unusually large number of swallows began nesting on the building, and their prolific droppings caused health and safety concerns. Stephanie Little, an activist with the Morro Coast Audubon Society, became concerned when she learned that the nests were being washed away only to have the birds come back the next day and start nest-building all over again. In just a few weeks, Erica Richards has been transformed from a vibrant 23-year-old who loved nature into a woman who’s battling for her life. In early January, Richards contracted a potentially fatal condition called cryptococcal meningitis, a fungal disease carried in the feces of pigeons. The debilitating illness attacks the spine and the brain, causing severe swelling. It left her confined to a hospital bed in a state of delirium for weeks. But the most devastating consequence of the sickness is that Richards is now blind. “Be aware of this disease. It could kill a child in a heartbeat,” Richards said from her hospital bed. Richards’ warning comes on the heels of Fredericton city council’s approval earlier this month of a recommendation it toughen its animal-control bylaw to make it illegal to feed pigeons. While such complaints are unusual, a problem exists on the city’s Grandame Street with a property owner who refuses to stop feeding the birds. The pigeons are roosting on roofs and defecating. There are songbirds, lovebirds and pet birds. And then there are pest birds. Birds we can all do without. Birds we don’t want to harm–we just want them to stay away. One way to do that is the subject of this article. If you’re a facilities or plant manager, you undoubtedly know that pest birds can cost you a ton of money and aggravation . They can easily invade your aircraft hangar, factory or warehouse, gathering by the hundreds in eaves, canopies and other large covered areas. Support beams make ideal landing, roosting and nesting areas for these pest birds. If you don’t keep them out with bird deterrents like bird netting, you’ll have to contend with all sorts of problems. One of the biggest problems with pest birds is bird droppings. Aside from being unsightly and unhealthy, droppings can stop up gutters and down pipes. They can also “freeze up” ceiling windows and vents, as well as rooftop turbine ventilators and siding windows. Bird droppings can eat into corrugated metal surfaces, cover light sensors and security cameras, even block out those new solar panels you just installed to save energy. In fact, the acid in bird droppings can eat into electrical equipment to create a fire hazard. If you manage a warehouse, bird droppings can spoil finished products in loading bays and storage areas. They can damage goods, and ruin the appearance of expensive finished goods. And something few facilities managers think about are slip-and-fall hazards created by bird droppings–this can become a costly legal liability should a worker or visitor become injured. So Your Building Has Birds…. A step by step guide to bird exclusion for commercial buildings. You’ve got birds. It could be gulls sitting on your roof top or maybe pigeons making a mess of signs and awnings. Perhaps you have an open loading dock and have starlings nesting in the rafters. Whatever the situation, all you know is that birds are creating a problem that must be addressed. So where do you start? You may be well aware of the need to implement pest control procedures for general pests such as mice and termites, but few consider the damage birds can cause to the exterior or interior of a building. Convincing management to include bird control measures into the budget can be easy when you present the benefits versus the cost. First, consider if you have a maintenance crew doing any regular clean-up of bird droppings. Outside of labor costs, there is the potential of damaged goods, lost customers or tenants, damaged machinery, and health concerns. The benefit of bird deterrents such as those offered by Bird-B-Gone is that they are often permanent solutions, different from common pests that call for regular treatments. Bird-B-Gone carries a variety of effective, humane products to fit nearly any situation. Like everything else you own or manage, buildings require regular maintenance to keep them from deteriorating. Regardless of the size of your building, certain specific tasks must be performed to ensure heating, cooling, ventilation, and air conditioning systems are operating properly and continue to meet health and safety codes. Bird proofing can prevent droppings, nests and other and other bird debris from damaging these important systems–systems that can be very costly to repair or replace. Likewise, a building’s plumbing systems, drains, drinking fountains, sprinkler systems and the timers that control them must be kept free of bird droppings and other debris to function properly. The same holds true for outdoor walkways, tables and chairs used by employees. Bird proofing will keep disease-carrying droppings from contaminating these areas. They can also prevent costly litigation should someone slip and fall on bird droppings. Exterior lighting and security cameras must be kept clear and fully functional to ensure the safety of visitors and employees. Bird droppings and nests can obscure and render these systems inoperative unless bird-proofing devices are installed. Similarly, exterior locks, doors and windows can jam up, leaving gaps in a building’s security and resulting in the need for expensive repairs. Finally, roofs, exterior facades and signage can be seriously damaged by pest-bird droppings and nesting materials. Roofs, especially, can be prohibitively expensive to repair or replace. The acid in bird droppings can quickly eat into painted signs and plastic, ruin expensive entry monuments and artwork, and crumble stone facades. All the more reason to invest in bird proofing before damage occurs. Today’s bird proofing solutions are humane and highly effective. Poisons and shotguns are out, scientifically designed bird deterrents are in. These are easy to install and virtually maintenance free. Most are visually unobtrusive and balance aesthetics with function. As an effective bird-proofing device, few deterrents come close to the Bird Spike. Birds have one heck of time trying to land anywhere near them. That’s because the menacing-looking spikes really intimidate most birds. The spikes come in stainless steel or rigid unbreakable polycarbonate. And while they look like they would impale a bird, the blunted spikes are harmless to birds or maintenance crews. Bird spikes can be used to deter a wide range of birds and work quite effectively on rooftops, signs, building ledges and other outdoor areas. For smaller nooks crannies, there’s the Bird Spider. Like the bird spike, it keeps pest birds from landing and nesting. While bird spikes are motionless, a spider’s arms whip around in the breeze to catch a pest bird’s eye. Spiders come in different sizes (different length spider arms) to deter different bird species. About: Dr. Rob Fergus is an ornithologist who specializes in urban ecology and human/wildlife interactions. Dr. Fergus received his Ph.D. in urban bird conservation from the University of Texas at Austin. He has teamed up with Bird-B-Gone as the official Bird-B-Gone Ornithologist to help close the gap between the science of nature, and the nature of bird control. Every once in a while when I’m traveling, I see a House Sparrow flying around inside an airport terminal somewhere. One day I actually saw seven together when I was waiting for a connection in the Cincinnati Airport! Airport terminals, retail stores, warehouses, and other large buildings often attract birds—usually house sparrows, European starlings, and rock pigeons (the more formal name ornithologists call pigeons). Keeping them off the building is usually possible with a well designed system of physical bird deterrents like bird spikes. But what can you do when the birds get inside the building? First item of business if you have a bird inside is to figure out how the bird is getting in. If there aren’t obvious answers—like doors left open—then the bird is a messenger telling you that you have a hole or some other problem with your building that you need to fix to keep the bird out, and to keep your building climate controlled and otherwise secure. If you have a warehouse or other building with open dock doors or other openings that are always open, keeping birds out will be more of a challenge. Look to see if you can install a door—or at least a vinyl strip doors or other type of seal or barrier. If you don’t seal up the door, you are going to have birds coming inside looking for nesting or food opportunities, or just to get in out of the weather. Urban sparrows, starlings, and pigeons are crafty creatures, always looking for ways to get inside. Some have even been observed waiting by doors or even triggering automatic doors to enter buildings! After you’ve taken care of the source of your problem, how do you get the birds out? If possible, shut off all the lights in the building and open up the doors—birds will usually go towards the light and fly out on their own. If this isn’t possible, you can use a live trap to catch the birds and take them outside. Traps can also be used to catch and release birds that get inside if you aren’t able to seal up their entryway. Mist netting can be used by professional bird control specialists to remove birds as well. Birds fly into the net, get tangled and are taken outside and released. House Sparrows, European Starlings, and Rock Pigeons are not native American bird species—they were brought here in past centuries—so they are not protected by federal laws that protect native birds. That means you can humanely dispatch the birds if need be, but it is always better to use non-lethal means to deal with your bird issues whenever possible. After all, removing the birds is not actually taking away the ability for new ones to return. Keeping birds out of your big box store should be easy enough to do with the simple steps outlined above. If for some reason you still have trouble with birds, feel free to give us a call (toll free at 877-820-8205) to discuss Bird-B-Gone products that might work in your specific situation. POMPEII, Italy, Dec. 13, 2010 (Reuters) — Pompeii mayor Claudio D’Alessio does not want to go down in history linked with Pliny the Younger, the Roman who chronicled the destruction of the ancient city nearly 2,000 ago in an eruption of Mount Vesuvius. The collapses sparked charges of official neglect by Prime Minister Silvio Berlusconi’s center-right government and calls for the resignation of Culture Minister Sandro Bondi, who has imposed cuts to arts spending as part of austerity measures. “We must invest in regular maintenance. This does not attract attention but is very necessary,” said Cevoli, adding that removing weeds from roofs and walls is not as enticing as light shows and holograms but it does stop water infiltration. Cevoli says there have been seven collapses in a year but not all of them have received the publicity they deserved. Judith Harris, author of the 2007 book “Pompeii Awakened,” said it would be important that sponsors let archaeologists do what they feel is necessary. “There is no glamour in pigeon control and weed removal but they are necessary,” she said. Pigeon droppings have been the source of deterioration and defilement on historic sites across the world. Recent renovations on Italy’s famed Leaning Tower of Pisa included the removal of pigeon droppings which had soiled many of the towers stones. Herculaneum, a lesser known city also buried in Mt. Vesuvius’s eruption in 79 AD was also recently having problems with pigeon droppings wearing away roofs and walls of the ruins. Damage done by bird droppings on a 14th century cathedral ending up costing the city of Milan and extra $7.9m or more in repairs. Bird droppings are acidic and will eat through paint, and corrode building materials such as stone and metal. Left unattended, affected areas may need restoration or complete replacement. Whether it’s an irreplaceable historic monument, or a contemporary roof or building, it is important to address pigeons or bird problems when they are noticed. The sooner a bird problem is addressed, the easrier it will be to persuade the birds to move on. Posted in Bird Control News, Bird Control Products, Bird-B-Gone In the News!